Slow down, simplify, and add a burst of color to your Advent. The spiritual practice of coloring mandalas (circular designs), lighting candles, and praying regularly can help us stay centered on God during this busy time of year. Based on the 4 candles of the Advent wreath, this coloring book for adults weaves together the popular practice of coloring with 4 simple methods of contemplative prayer. This is more than just a coloring book for adults—it is also a visual prayer journal. 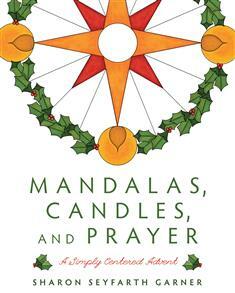 Each chapter includes a short vignette, an explanation of the weekly theme and prayer method, a simple candle-lighting liturgy, 7 mandalas for each week of contemplative coloring, and a closing prayer of illumination. Let the candles light the way and calm your spirit. Color and pray. And you will experience the most meaningful gift of all—a peace that passes all understanding as you journey prayerfully toward the manger.